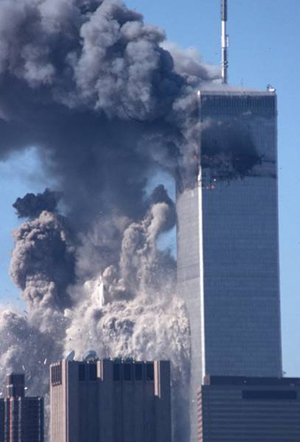 Dr. Judy Wood, a former assistant professor at Clemson University, has developed compelling evidence that a directed energy weapon turned the physical matter of the World Trade Center towers into nano-particles through the process of molecular dissociation. "advanced explosive nano-thermitic composite material found in the World Trade Center dust," or solely by 4th generation mini-nukes. “a decision will be made in a matter of weeks on where to try the alleged mastermind of the Sept. 11 attacks,” indicating that the Obama administration has a pre-determined position on the evidence that the events of September 11, 2001 were a false flag operation. United States v. Khalid Sheikh Mohammed, et al. "is the upcoming trial of five alleged Al-Qaeda members for aiding the September 11, 2001 attacks. Charges were announced by Brigadier General Thomas W. Hartmann on February 11, 2008 at a press conference at the Pentagon. The men charged are Khalid Sheikh Mohammed, Mohammed al Qahtani, Ramzi Binalshibh, Ammar al-Baluchi, and Mustafa al-Hawsawi. In an 88-page complaint, the group was charged with attacking civilians, attacking civilian objects, intentionally causing serious bodily injury, murder in violation of the law of war, destruction of property in violation of the law of war, hijacking or hazarding a vessel or aircraft, terrorism, and providing material support for terrorism. If convicted, the five will face the death penalty." Regardless of whether U.S. President Barack H. Obama chooses to have these defendants tried in a U.S. Military Commission or in a U.S. Federal court, the evidence amassed by such researchers as Dr. Judy Wood and Architects & Engineers for 9/11 Truth satisfies the burden of proof that the events of September 11, 2001 were, beyond a reasonable doubt, a false flag operation. Consequently, one can characterize the forthcoming trial in United States v. Khalid Sheikh Mohammed, et al as a political show trial, no different in effect – the wrongful execution of the defendants and the attempted hoodwinking of the U.S. and world population – from other political show trials in recent history. This Examiner article in the continuing 9/11 series examines the evidence for the use of secret advanced directed energy weapons in the molecular dissociation of the World Trade Center buildings into nanoparticles on September 11, 2001. The article discusses the implications of this evidence, in light of Andrew D. Basiago’s eyewitness evidence that a secret DARPA time travel program, whose defense liaison was then Nixon Cabinet Secretary Donald H. Rumsfeld, was in physical possession images of the World Trade Center 9/11 events in 1971, 30 years before the actual events occurred on September 11, 2001. Dr. Judy Wood has developed multiple lines of evidence that demonstrate beyond a reasonable doubt that the molecular dissociation of the physical matter of the World Trade Center towers into nanoparticles on September 11, 2001 was the product of a directed energy weapon. Readers are urged to review this evidence here. When a jury in a court of common law is determining a question of fact, as to whether secret advanced technologies, such as quantum access time travel and teleportation, and secret directed energy weapons on 9/11, the members of the jury resort to the standard of reasonableness in weighing direct and expert witnesses, and documentary evidence. "In systems of proof based on the English common law tradition, almost all evidence must be sponsored by a witness, who has sworn or solemnly affirmed to tell the truth. The bulk of the law of evidence regulates the types of evidence that may be sought from witnesses and the manner in which the interrogation of witnesses is conducted during direct examination and cross-examination of witnesses. Other types of evidentiary rules specify the standards of persuasion (e.g., proof beyond a reasonable doubt) that a trier of fact such as a jury must apply when it assesses evidence." "Evidence of an indirect nature which implies the existence of the main fact in question but does not in itself prove it. That is, the existence of the main fact is deduced from the indirect or circumstantial evidence by a process of probable reasoning. The introduction of a defendant's fingerprints or DNA sample are examples of circumstantial evidence. The fact that a defendant had a motive to commit a crime is circumstantial evidence. It is possible to argue that all evidence is ultimately circumstantial, on the premises that no experience whatsoever can directly prove a fact. Recall, however, that courts of law deal with what is reasonable, not with ontology." One researcher (below multimedia) draws on Dr. Wood’s work and sets out a sample of documentary and witness evidence sufficient to conclude that an advanced directed energy weapon was used on the World Trade Center (WTC) buildings on 9/11. “Should have been 1/3 the height of the WTC buildings. The 100+ story WTC buildings were about 1 story high when the collapse of the buildings ended. “Spectral absorption images at the WTC indicated average particle size was about 1 micron, which is subjected to gravity and would have fallen with the collapsed buildings. The WTC dust got into the upper atmosphere almost immediately – which indicates very tiny atmospheric dust sized particles (0.1 micron and smaller), in fact smaller than atmospheric dust that stays mainly in the Troposphere. Where Were All the WTC Bodies? In 1955 the microwave oven was invented and was a concept for a beam weapon. In the summer of 1990, the researcher observed a demonstration of the Livermore Shiva laser facility in the middle of the night. A 16’ diameter amber colored beam was shot straight up into the sky from the lab and all air traffic was diverted for a 5 mile radius during the demonstration. When the researcher asked a grad student working at the laser facility what they were trying to do, he said, “Make a star”. The researcher knew that could not be true because lasers are used to molecularly dissociate materials by releasing tremendous amounts of energy as very advanced and complex waveforms. Livermore had long been involved in development of HAARP [a directed energy weapon] since 1978 in secret collaboration with the Soviet Union, and advanced beam weapons. of the evidentiary conclusion that an advanced directed energy weapon was used in 9/11? The documentary and witness evidence presented by Dr. Judy Wood and other researchers is sufficient to conclude, by the laws of evidence, that it is more probable than not that an advanced directed energy weapon was used on the World Trade Center buildings on September 11, 2001. "advanced explosive nano-thermitic composite material found in the World Trade Center dust"
perhaps even 4th generation mini-nukes. It is plausible that these latter two technologies were employed to mask the use of advanced directed energy weapons in the molecular dissociation of the physical matter of the World Trade Center towers, to sow doubt in any official 9/11 investigation and in the 9/11 truth movement, and thus to preserve the secrecy of directed energy technology application. The use of an advanced directed energy weapon in 9/11 demonstrates beyond a reasonable doubt that 9/11 was a false flag operation. If an advanced directed energy weapon had been used by an overt foreign enemy of the United States upon U.S. soil (the World Trade Center), the U.S. military would have used every possible means to retaliate against any foreign enemy that used such an advanced directed energy weapon. There is ample notice on the public record of Dr. Judy Wood’s evidence regarding the use of directed energy weapons at the World Trade Center buildings on 9/11. Starting in March 16, 2007, Dr. Judy Wood has pursued requests for correction with the National Institute of Standards and Technology (NIST) regarding evidence for directed energy weapons. Dr. Wood filed a Qui Tam action filed at the United States District Court for the Southern District Of New York. A writ of certiorari was filed in this matter in the Supreme Court of the United States on October 14, 2009 and was recently dismissed by the U.S. Supreme Court. The U.S. Department of Justice or a prosecutor before a U.S. Military Commission that is prosecuting the defendants in United States v. Khalid Sheikh Mohammed et al. can be reasonably deemed to have notice of the evidence that directed energy weapons were used against the World Trade Center on September 11, 2001. This evidence is contained in Dr. Wood’s proceedings at National Institute of Standards and Technology (NIST), and her Qui Tam action U.S. District Court for the Southern District of New York, and the U.S. Supreme Court. Dr. Judy Wood’s evidence is of public importance in the question of a trial of the alleged “masterminds” of 9/11 in which capital punishment may result. Regardless of ultimate judicial venue (U.S. Federal court or U.S. Military Commission), if the trial of the defendants in United States v. Khalid Sheikh Mohammed et al. proceeds without the Department of Justice prosecutors, the U.S. Attorney, the U.S. President, the U.S. Federal Court or Military Commission, or the defense attorneys having weighed the evidence of directed energy weapons having been used in the World Trade Center, then a major miscarriage of justice will have taken place. It can be reasonably concluded that the trial in the matter of United States v. Khalid Sheikh Mohammed et al. is a political show trial and continued psychological operation, as was the original false flag operation of September 11, 2001. “is a pejorative description of a type of highly public trial. The term was first recorded in the 1930s. There is a strong connotation that the judicial authorities have already determined the guilt of the defendant and that the actual trial has as its only goal to present the accusation and the verdict to the public as an impressive example and as a warning. Show trials tend to be retributive rather than correctional justice. The eyewitness evidence of Cambridge-educated environmentalist and lawyer Andrew D. Basiago that a secret DARPA time travel program had physical possession as early as 1971 of images of the events of at the World Trade Center buildings on 9/11, 30 years in advance of the event must now be evaluated with the evidence of Dr. Judy Wood and other researchers that directed energy weapons were used at the World Trade Center buildings on 9/11. Both of secret time travel and teleportation technologies and directed energy weapons are among the most secret and the most advanced technologies in the arsenal of DARPA and the U.S. Department of Defense. The fact that a 9/11 connection has been established for both secret time travel and teleportation technologies and directed energy weapons around one individual of Cabinet rank in both 1971 and 2001 is of high evidentiary importance. By the evidence, that individual is Donald H. Rumsfeld, defense liaison to DARPA’s secret time travel program and a member of U.S. President Richard M. Nixon’s cabinet in 1971, and 30 years later, U.S. Secretary of Defense on September 11, 2001 with line authority over advanced directed energy weapons of the U.S. government. The next article in this multi-part Examiner series on secret technologies and 9/11 will explore the reasonable prima facie evidence for the criminal indictment and trial for treason (Article III (3) of the U.S. Constitution) or misprision of treason (U.S. Code 18, Sec. 2382), of then sitting U.S. president George W. Bush, vice president Richard B. Cheney, U.S. secretary of defense Donald H. Rumsfeld, and numerous Jane and John Does. Back to Non-Lethal Weapons - "Psychotronics" and "Silent Sound"